His voice is loud and his instructions are clear but I still don’t understand what we’re supposed to do. “March! March! Beans on toast!” he repeats, looking straight at me. It’s before breakfast but we’re not in the queue for the buffet and this isn’t a cookery lesson. The man staring at my confused expression and two left feet is AJ Pritchard, one of the professional dancing stars of the BBC’s hit show Strictly Come Dancing. He’s trying to teach me the cha-cha-cha, and I’m so terrible that he has resorted to spelling out the rhythm using a method that works with children. “Just keep in time,” says AJ, 23, repeating his chant and showing me the steps. My stomach is beginning to rumble at the constant mention of beans on toast but there’s no time for food right now. I’m in the middle of a private lesson with AJ – who came fifth in the last series with The Saturdays’ Mollie King – and his long-term dance partner Chloe Hewitt (they began dancing together at the age of 11 and became the British and European Youth Latin Champions in 2015). 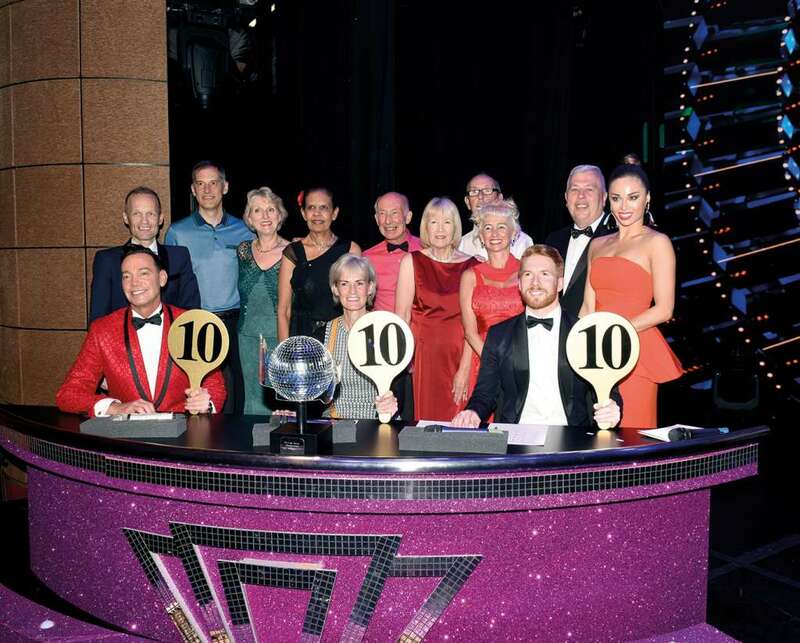 We’re on board P&O Cruises’ Azura for a fortnight’s meander round the Med, but this cruise is extra-special: it’s a Strictly Come Dancing spectacular with glitter, glamour and the gorgeous stars of the show on board. Oh, and judge Craig Revel Horwood will be joining us at some point too. Thinking about Craig and his acerbic remarks, my feet stutter, then they stumble, then finally I trip. “Must be choppy today,” I say. Unfortunately, we’re opposite a huge window and the sea outside is barely making a ripple. AJ raises a perfectly arched eyebrow. “Now it’s time for the Cuban break,” he says. That sounds good, as I’m rather out of breath, but he doesn’t mean a rest. The Cuban break is a series of steps where you place one foot across the other and step backwards and forwards in time to the music. How hard can it be? Very, as it happens, as it has to be done in time to the music, which keeps getting faster and faster. My chest is already pounding when Gorka Marquez – the resident Strictly heartthrob – strolls in. I’m mesmerised by the naturally graceful movements and stunning looks of this Spanish Latin champion, who set pulses racing all over Britain when he did the tango with dance partner Alexandra Burke, and who captured the heart of competing celebrity Gemma Atkinson in real life. As soon as my lesson is over, I rush to talk to him while he’s putting on his Cuban heels. “Can I have a picture with you?” I ask. Standing, he comes up to just below my eye level. I bend my knees while taking the picture so we’re a similar height. I’m tall – 5ft 10 – but I soon realise everyone on Strictly is neatly packaged. This is apparent from the costumes on display around the ship’s atrium. From This Morning TV star Ruth Langford’s flame red and Hawaiian pink Latin dress (Week 5 samba) to Gemma Atkinson’s gold and black ballroom creation (foxtrot, also Week 5) and Alexandra Burke’s peppermint and cream ballroom gown (Week 1 waltz), it’s clear that all these women are tiny. Later I spot Gemma by the pool. On TV she looked curvy. In the flesh she’s a glamazon – slender with a teeny waist, beautiful face and cheekbones you could grate Parmesan on. “Oh, so you two are together,” I keep hearing Strictly fans say, as they bump into Gemma and Gorka around the ship (most often in the gym, which is how he keeps that six-pack). In fact there are celebrities everywhere you turn. Emmerdale star Anthony Quinlan is tanning himself on the top deck next to his girlfriend, Strictly newcomer Dianne Buswell, a beautiful redhead who dazzles us later in the Playhouse theatre. Her flaming hair and spangly shoes a blur, she jives and cha-cha-chas round the stage, smiling as Gorka throws her in the air and catches her so that she dangles upside down – to wild applause from the crowd. All this and it’s only Day Two of our fortnight’s cruise from Southampton. Both have been sea days – and it’s been time well spent, getting to know the ship as well as those dance steps. One of P&O’s largest ships, Azura underwent a £16 million refit in November 2015. She now boasts a three-deck atrium, with café, art gallery, library, boutique and duty-free shops, as well as the Oasis Spa, gym, and casino. There are six restaurants, a poolside pizzeria, and four select dining outlets including celebrity chef Atul Kochhar’s Sindhu. And we’re lucky because Mr Kochhar himself is actually on board to work his magic in the kitchen (he’s one of P&O Cruises Food Heroes, and you can read all about him on page 82 of this magazine). The food is exceptional. We opt for club dining at 6.30pm every night in Oriental, so we can get out in time to watch all the Strictly showcases and other entertainment. But that’s easier said than done, because every dinner is six courses (soup, starter, salad, main, dessert and cheese board) and every morsel is delicious. Luckily, there are daily ballroom classes in the atrium with the on-board instructors to work off some of those calories, as well as the Strictly shows for inspiration. AJ is my favourite among all the Strictly stars, which leads to some lively arguments with my fellow diners who plump for Gorka – until Neil Jones takes to the stage with his wife Katya, the current Strictly champion. It’s immediately obvious why this couple are four-times British National Champions and three-times winners of the World Amateur Latin Championships. The couple first met 10 years ago, and they were world champions shortly after. Katya, 28, was nominated for a Bafta after her first Strictly series for her ‘Gangnam Style’ salsa with ex-MP Ed Balls, and took the Glitterball trophy last season with Joe McFadden. There’s plenty of that to be seen everywhere you look on this cruise, with many of the guests practising to audition for the Strictly competition, to be judged by Craig Revel Horwood himself the following week. So it’s amid a flurry of rehearsals, costume-tweaking and nervous excitement that we steam towards our first port of call, Alicante. There’s so much happening on board that it’s difficult to tear ourselves away and go ashore. But with a promenade lined with palm trees, and a skyline dominated by the Castillo de Santa Barbara, an ancient fortress with a history dating back to pre-Christian times, this Spanish city proves well worth the effort. The weather is always good here on the Costa Blanca, which is why the Romans knew Alicante as Lucentum, or City of Light. Bargains abound, and you can pick up leather, antiques and Lladro – the famous Spanish porcelain – in the Calle Maisonnave and Rambla de Mendez Nunez, conveniently near the ship. Back on board that evening it’s time for another after-dinner Strictly showcase, and a mesmerising performance by Jayne Middleton as Annie Lennox (except for the bank balance, you can’t tell the difference). The next day sees us docking in Barcelona, where we stroll down the Ramblas and take in the incredible work of architect Antoni Gaudi, including the amazing but still unfinished Sagrada Familia cathedral. For football fans there’s a pilgrimage to the Camp Nou and Museum of FC Barcelona, and that evening there’s time for karaoke, during which I traumatise the audience in Brodie’s Bar with a tuneless rendition of Jolene before calling it a night. The following morning we catch tender boats to visit Toulon, home of the French Mediterranean fleet. Behind the huge steel-grey warships there’s a pretty town with an opera house and daily flower markets. But it’s award-winning comedian Mark Walker (son of Catchphrase host Roy) who everyone is talking about that evening, as he takes off Freddie Mercury, Liam Gallagher and Ozzie Osbourne. Another new day brings us to La Spezia in northern Italy. Pisa and Florence are within visiting distance but I prefer to look round the shops and linger over pizza at a café. It’s the following day I’m really looking forward to, as we’ll be docking at Civitavecchia, gateway to the Eternal City, Rome. I got married there, my children were christened there and I just can’t get enough of Italy’s capital. I take the Essence of Rome tour which is expensive (£110) but worth every penny. Over the course of ten-and-a-half hours I visit the Colosseum, the Trevi fountain and the Piazza Venezia, and taste the best lasagne ever at a local restaurant (everyone on the tour agrees). Then it’s time for one place I’ve always wanted to see: the Sistine Chapel. Somehow, over the 21 years that my Roman husband and I have been together, we’ve never made it through the door. It’s worth the wait. 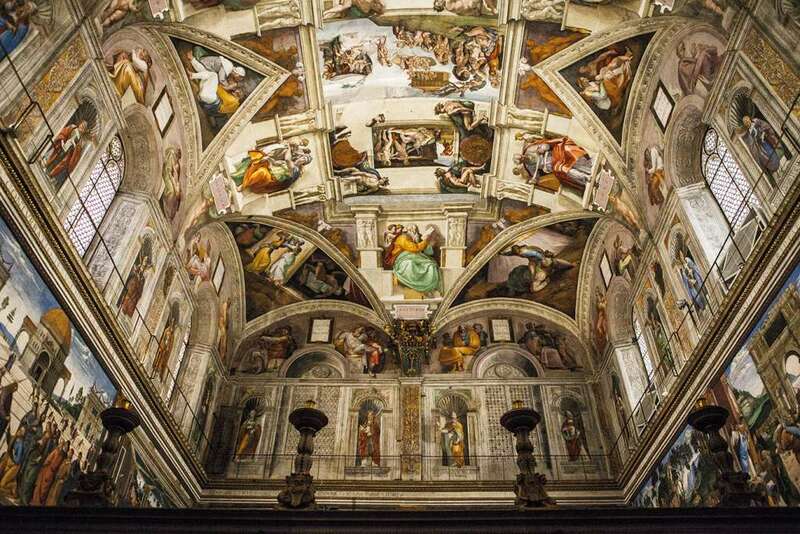 Alongside paintings by Perugino, Botticelli and Ghirlandaio is the world-famous ceiling of frescoes by Michelangelo, and his Last Judgement on the altar wall, which took the Renaissance master seven years to complete. It’s a “wow” moment that hushes the hundreds gathered inside to a reverential silence. A quick scoot round St Peter’s Basilica inside the Vatican and I’m the happiest I’ve ever been on a tour. It’s been a long day but a brilliant one and I fall asleep on the coach back to the ship. We still have the Spanish port of Cartagena to see, and then Gibraltar, but right now I’m looking forward to just one thing: the arrival of Craig Revel Horwood. He’s in pain, as he’s waiting for a hip replacement, but here he is, larger than life and sipping champagne at a tell-all Q and A session. He goes on to regale us with stories that are much too rude to print, and tells us how he had to escape an abusive, alcoholic father, taking endless deadbeat jobs to pay for his dance lessons. Dancing was always Craig’s dream ticket out of small-town Australia, and the dream eventually came true. Then, after a stellar career performing and directing, he was picked for Strictly as the judging panel’s Mr Nasty. I’m terrified for the passengers who have to perform for him in the onboard competition. But even though some of them are stiff, some miss their cues and mess up their steps, Craig is honest in a gentle way, honouring the bravery they’ve shown in performing before thousands of their fellow guests. Finally he finds a couple who deserve a 10, for their lively jive. “You weren’t ghaaastly, dahlings,” he says, and the audience cheers. Craig is only a pantomime nasty judge – it’s mere theatrics and he’s really rather nice, with a dodgy hip and plenty of charisma. He certainly wins over his audience on Azura (I’m going to practise my cha-cha-cha in case I bump into him after his surgery). I leave the ship smiling. It’s been a fab-u-lous trip and I know what I need to do now: keeeeeep dancing.